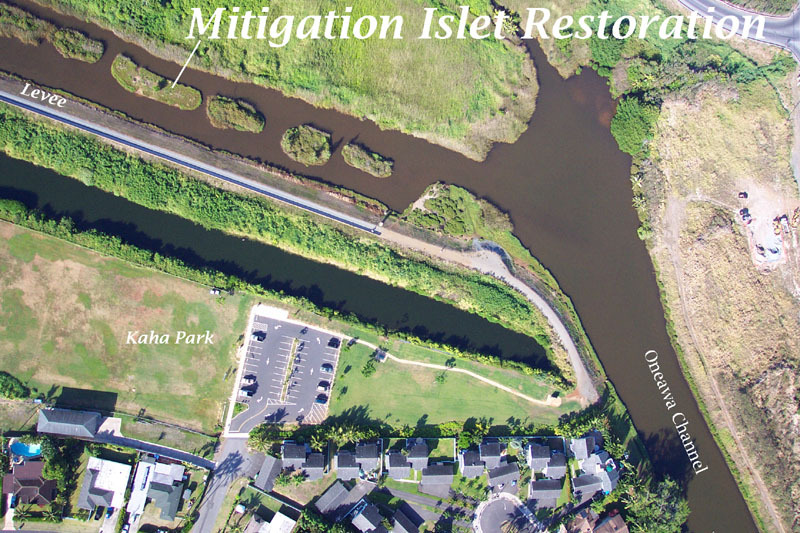 The air photo above, taken by Brian Daniel from an ultra-light, shows six of the "mitigation islets" located on the Oneawa Channel mauka of the Kawai Nui Marsh levee, with the islet selected for restoration work indicated. 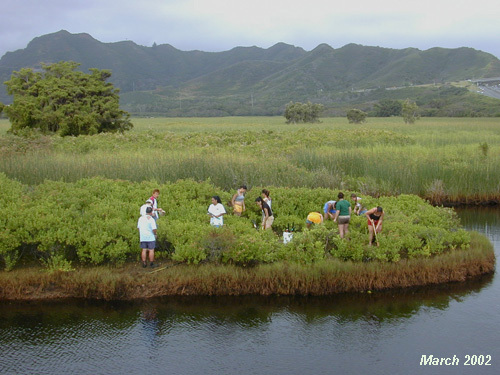 When this photograph was taken, the scrub growth of sourbush had already been removed from Islet No. 4. 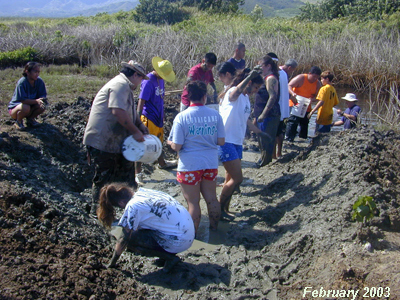 The first group of volunteers under the guidance of ‘Ahahui Mālama i ka Lōkahi arrived in March 2000 and were tasked with the removal of the dense scrub growth of non-native sourbush (Pluchea indica). 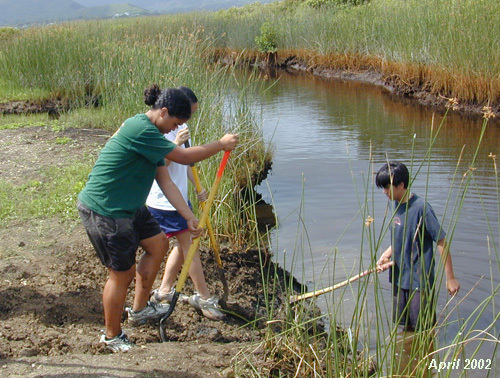 Volunteer groups visited again in April 2002 to complete the removal of scrub piles and pull sourbush seedlings. The April group also started laying out locations of channels and ramps to be dug into the islet to facilitate wetland plant growth and waterfowl access. 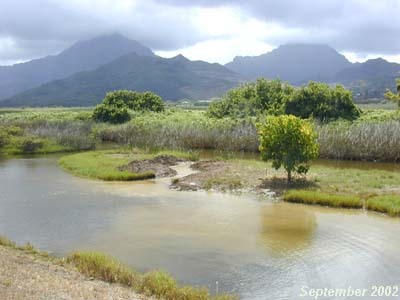 By September 2002, a narrow 'tidal' channel gently meandered across the islet. A milo tree (Thespesia populnea) that had seeded naturally on the islet was not removed. 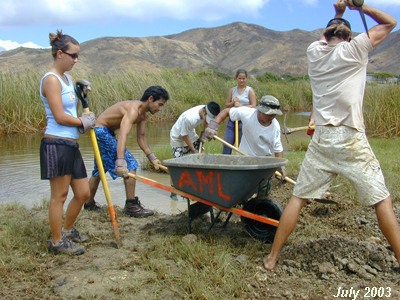 Volunteer groups worked the restoration site in February and July 2003 with removal of weed seedlings and enlarging/deepening of the channel through the islet. 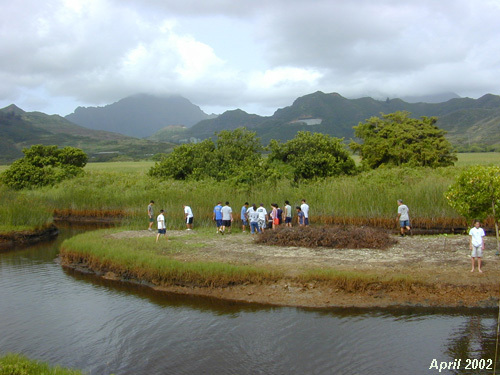 A second channel was created crossing near the west end of the islet.